In Papua New Guinea oysters have long been a delicacy for people living along the coast and river deltas. Oyster shells – particularly the smooth, iridescent mother-of-pearl on the shell's inner surface – are also highly prized and used for the purposes of trade and exchange. Although precious and rare, naturally grown pearls are not often used in PNG; it is the shells that are transformed into tools and weapons, or into fine, intricate ornaments for decorating carvings or the human body. Large oyster shells from the coast often found their way into the highlands through trade and exchange. Here the shells (called 'kin' in Melpa) were scraped, washed, cut and polished to a smooth, shiny, gold-like colour. The mantle-end of the shell (where the oyster was located) was cut out to form a 'U' shape, then set into a wooden, egg-shaped mount using resin from the 'kilt' tree, and adorned with bamboo sticks ('omak') and red ochre. The 'omak' tally records wealth given to others in a complex system of exchange – known as 'moka' – in the form of pigs, pearlshells and, from the 1960s, money. 'Moka' exchanges first occurred in pre-colonial times as reparation for the loss of human life during warfare. 'Kin' became the most prestigious item in 'moka' exchanges as they were not 'produced' in the region, as pigs were, and represented influential social ties established by Big Men in Melpa society. The ability of Big Men to obtain and trade in shells, as well as pigs, was a form of competition between rivals. At 'moka' exchanges, 'kin' were carefully laid on the ground where they would be ceremoniously counted, just as rows of pigs tied to stakes would be tallied. Red ochre was applied to the shell's surface to enhance the 'kin's' appearance and was interpreted by onlookers: if the 'kin' was 'read' as bright and glowing, a quality admired in decoration, it was described as 'eng nurum' and indicated that the owner would prosper; if it was drab and dreary, the 'kin' was seen to be 'rumblug nurum', which foretold future problems. 'Kin' were highly sought-after in the highlands. They were exchanged between rivals in peacemaking ceremonies, and also given as bridal gifts and as payment in marriage and mortuary ceremonies. Their acquisition was the subject of dialogue among community leaders and occasionally the reason for war. Shells were sometimes cut into a semi-circular rainbow shape or (even more finely) into the shape of a new moon. Fine thread, often adorned with beads, was strung through holes at each end of the rainbow-shaped shell so that it could be worn around the neck ('kin mapa'). Men, women and adolescents wore the shells shaped like new moons as nose ornaments. For the purposes of display and mobility 'kin' were sometimes fitted with a knitted carrying band ('kin mema rui'). Special packing cases for 'kin' were also made from bark. Once dried and hardened, the inside of the pouch was layered with soft dry leaves into which the prepared 'kin' was placed and either stored in men's houses or carried by persons over land to those who desired its presence. The importance of 'kin' declined by the 1960s when their worth was substantially devalued by the influx of shells from the coast, brought in by the Australian administration and by missionaries and settlers to pay for labour and food. As Hageners began to create exchange networks beyond traditional partners, 'kin' were gradually replaced in 'moka' exchange by money. 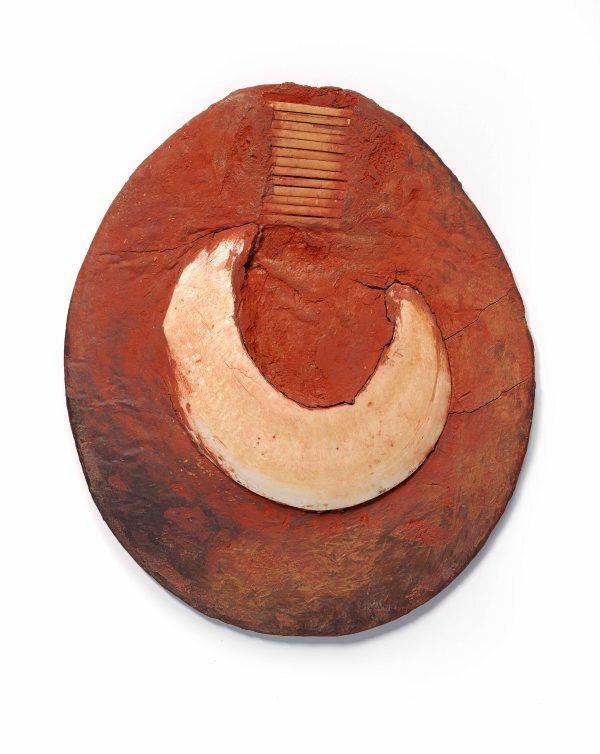 Michael A Mel, 'Moka kin (mounted pearlshell for 'moka' exchange)', in Natalie Wilson (ed), Plumes and pearlshells: art of the New Guinea highlands, AGNSW, Sydney, 2014, pp. 42-45.